Planning daily activities for a diabetic by itself is an arduous task. When it comes to travelling, it definitely disturbs your diabetic care routine. Here are a few tips which may help you have a safe travel. • Keep things that are required handy. 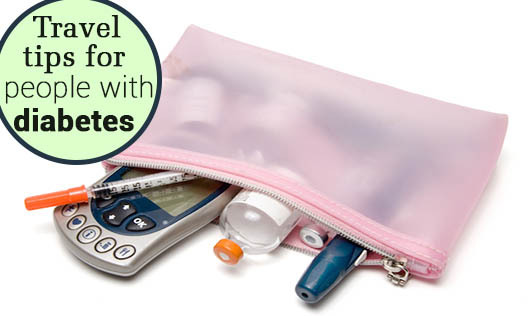 Make sure your diabetic supplies are easily accessible. If you're flying, make sure these supplies are included in your cabin luggage as the check-in baggage may be exposed to extreme climatic conditions which may spoil insulin and the glucometer. Do not use a freezer to store insulin, opt for a cooler instead, irrespective of the mode of travel. • Try sticking to your schedule. While travelling, most diabetics skip or forget about their diabetes care schedule. Pack extra snacks so that you can use it in case there is a need. • Carry a note from your doctor. In case you are travelling alone, carry a note from the doctor stating you are diabetic and that you need to carry the prescribed medicines with you at all times. • Inform the airport security officer. When flying, pack your diabetic medicines and liquids in a separate cover so that the screeners can easily separate the diabetic medications from the rest. • Be prepared for low glucose levels. Pack a few glucose tablets so that you can take them when your sugar levels are alarmingly low. • Carry enough supplies. If you have planned to stay at a place for a week, carry your medications for twice as much time as you intend to stay. Make sure you have back up for the other requirements like the glucometer etc. • Test your blood sugar regularly. Travelling disturbs your diabetic care routine to quite an extent. Blood sugar levels vary because of lack of physical activity. • Stretch a little. While travelling long distances, make sure you get up from your place and move around hourly once or at least stretch a little so that the chances of blood clots which are usually high in diabetics is reduced. • Maintain a record of emergency contact numbers with you always.